Are you looking at me? 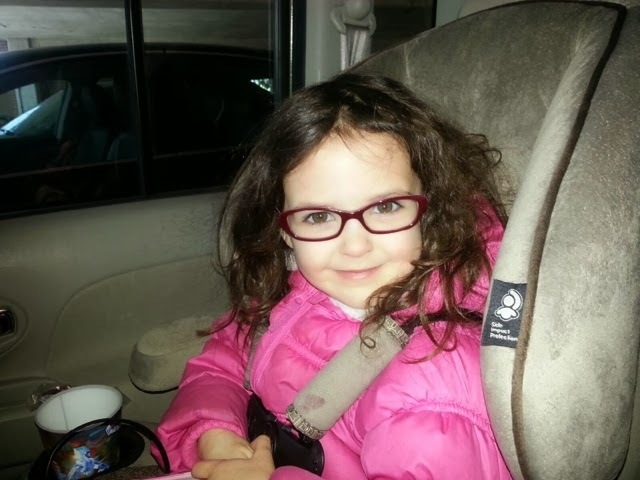 - Living with Stargardt's Disease (a visual impairment): My kid needs glasses... So what? My kid needs glasses... So what? A recent experience has had me wanting to write a blog post but not quite knowing how. It is something I apparently needed a long time to process. On Valentine's Day, we brought our 5 year old to the eye doctor. We learned that she has an astigmatism that causes her right eye to be weaker than the left and cannot be corrected to 20/20. She needs to wear glasses. Big deal, right? As we were leaving the appointment, the ophthalmologist assured me for the second time "Her retinas look beautiful." So, obviously this is not a major issue and I am VERY relieved that her retinas are fine. So, why have I been sad? The whole experience of our visit to the eye doctor is almost indescribable. It brought back memories of my childhood eye doctor visits. Sitting in that chair not being able to see much more than the Big E. Guessing what letters were there and feeling like I should be able to do better. Obviously knowing I had no control over it but still feeling inadequate. How awful and heart wrenching it must have been for my parents! At my daughter's appointment, I sat there not being able to see what she was supposed to be seeing. So the only way I knew if she was seeing the letters correctly by the doctor's reaction. When she struggled to see, I so badly wished I could help her... The emotional reaction I had no doubt pales in comparison to what my parents felt years ago. I have never had much sympathy for people whose vision is correctable by glasses. While some might complain about wearing them, I wish it were that easy for me. So, finding out that my child needs glasses should not be a big deal. And it's not. So why does it make me sad? Is it that my kid is not perfect? Is it that I want to protect her from the teasing she will inevitably experience at some point? Maybe its because, I know she does not like being singled out. Or maybe I have had enough experience with low vision for all of my kids and was hoping they would not have to deal with it. But, my sadness is definitely overpowered by my relief that there are no signs of Stargardts. The day after her appointment, she was having a hard time falling asleep and when I checked on her, she asked me why she needed glasses and started to cry. It broke my heart. I guess it's just hard to see your child go through any type of struggle, however small. When we went to pick out her frames, she instantly selected a purple pair with gems on them. They just so happen to be the pair my husband knew she would go for. He works at the practice where the optical shop is located so he had scoped them out days before. She was actually kissing the frames that day! We picked the glasses up this past Friday. I must say she looks absolutely ridiculously cute in them! She wore them to a birthday party for one of her friends on Saturday. I was so proud of her for choosing to wear them. We had said she could leave them off while at the party (an indoor playground with lots of inflatable slides, structures, opportunities to tumble and fall.) But she wanted to show her friends. She got positive reactions, especially from the other parents! I think this will make wearing them to school on Monday an easier transition for her. I feel sad that she has to wear glasses. I feel extremely happy that her retinas look good. I feel grateful for my amazing parents. I feel proud of my little girl. Ok, Heather, you know me and know I am rarely at a loss for words. But, right now my mind is so full of thoughts. When Alexis had to go for her check up, I was a mess even though I knew it was unlikely to be Stargart's. But, see, UNLIKELY. When you and Chip got back with Alexis you knew what I was thinking. And I could see in your face that you too were worried. All those appointments came flooding back. God, please. Then you told me her retinas were fine. Immediate relief. You know me so well, my Sweetheart. I didn't even tell you what I was so very worried about....you knew. Yes, we should be ashamed at ourselves for being sad that she has to wear glasses. You would think that after wishing since you were 9 that you COULD. wear glasses to help you, that I would seriously not be sad. But, I was. Strange, Jon had to wear a back brace,. It bothered me but I knew it had an ending. and he could wear it in the privacy of his home. Well, we are pretty sure Alexis' eye will strengthen but will she still need glasses? Mostly likely not for awhile anyway. But, I guess my point is that she has to wear them around her peers. Who will tease her? Will they all accept the change? We all know kids can be cruel. And our Alexis is so sweet and so private. How will she do? Well, she's done amazingly well! And who couldn't love her in those gorgeous glasses she picked out! As parents it is so difficult for us to not let go. It is so hard to see our children struggle, even if it isn't a huge struggle. And, you Heather, have had to deal with so many struggles. Like you said, you felt like maybe your girls would be free of your struggle. Good news is Alexis only has to strengthen one eye. We are lucky. Blessed and relieved. Thank you for all your kind words about your Mom and Dad. You were the brave one. We took our cues from you! Looks to me like your two beauties are turning out to be just as brave, as thoughtful, as loving as you. Great post as always. Sorry, you have to relive all this. Very proud of the way you held yourself together during this with Alexis. Fortunately, I am the only one in my immediate family who does not need glasses. That didn't stop my parents from dragging me to the eye doctor when I was younger, though. I hate those dilating drops. I have seen my sister deal with the problems of glasses which makes me more thankful.